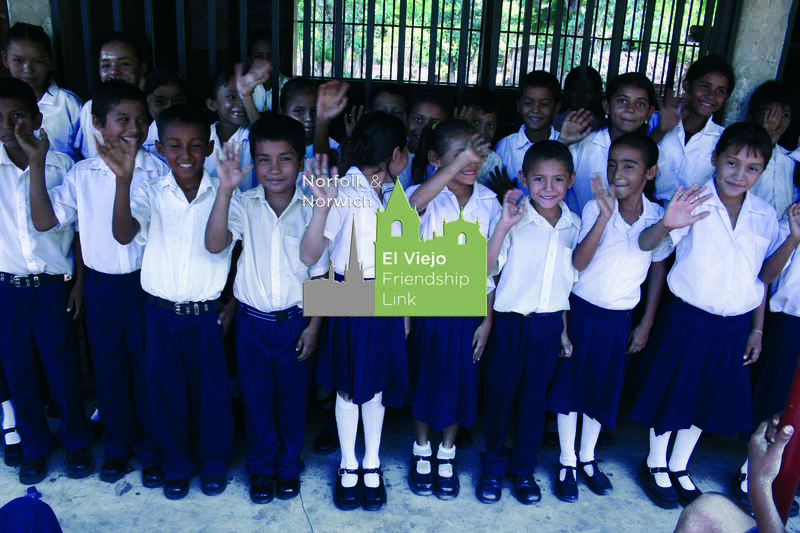 The Parish Church in El Viejo occupies a central position in the city both in terms of its size and its importance in the community. December is a significant period for both the church and the city. The church is described as ‘one of the most notable colonial monuments of Nicaragua’. Its style is Baroque and neoclassical, with wide atria and was built in the first quarter of the 17th century. It is one of the oldest churches of Nicaragua. Of magnificent construction, it contains jewels and sacred relics of the first years of the Spanish Conquest. The interior consists of three wide aisles above a large altar that shines with a stupendous frontal of Peruvian silver. The famous image of the Virgin, brought to El Viejo by the brother of St. Teresa of Avila in 1565, is displayed above the altar inside a baldachin, also of silver, with the following inscription: “Captain Don Francisco of Aguirre gave this pedestal, in the year 1703.” The structure was seriously damaged by a spectacular eruption of the Cosiguina volcano in 1835, which threw out material as far as Mexico to the north and Columbia to the south. El Viejo itself was in darkness for four days. The church was restored in 1884. In 1854 Pope Pius IX issued his proclamation of the doctrine of the Immaculate Conception, giving a boost to the Marian movement and to the importance of the church in El Viejo. In 1944 the church was declared to be a National Sanctuary of the Virgin Mary, patron of Nicaragua, and important to Catholics throughout the country and beyond. It was upgraded in status to ‘Basilica Menor’ (Lesser Basilica) by Pope John Paul in 1995. The church is central to the life of the town. Its festivals have dominated the social calendar officially and unofficially for years. December, especially, is famed for the Festival of Our Lady of the Immaculate Conception, known as the ‘Griteria’, and the ceremony of ‘lavar la plata’, the washing of the silver – the church’s magnificent treasures of silverware accumulated over the years from donors. The Griteria on 7th December is the biggest popular festival of the year, more important than Christmas. It dates from the end of the 17th century. In church terms it celebrates Mary’s conception of Jesus and in popular terms it is a day of people going round the houses caroling, giving and being given goodies, sweets, cakes, visiting the little shrines each household sets up, complete with lights like our Christmas trees. Women and children troop the streets chanting ‘Quien causa tanta allegria’ (Who causes such happiness) to which the householders reply ‘La concepcion de Maria’ – Mary’s conception.